Using US census data, creator Brian Lee Yung Rowe has developed an interactive map showing how names have grown and waned in popularity in different states since the early 1900s. Inspired by a recent baby name visualization, Yung Rowe wanted to see how a single name spreads across the country based on its prevalence in each state. So, for example, while a name like Brian never tops the list, it still has ebbs and flows of popularity that might be worth tracking. Just put a name in the box, choose whether you want to look at male or female names, and press Go; there are more than 29,000 names available, including those that appear for both genders. Each state gets highlighted over time according to the proportion of the babies with that name. One of the more interesting take-away's from this map is how some names are geographically clustered. Take a look at the name "Terrence" and how it has changed from 1946 to 1987. 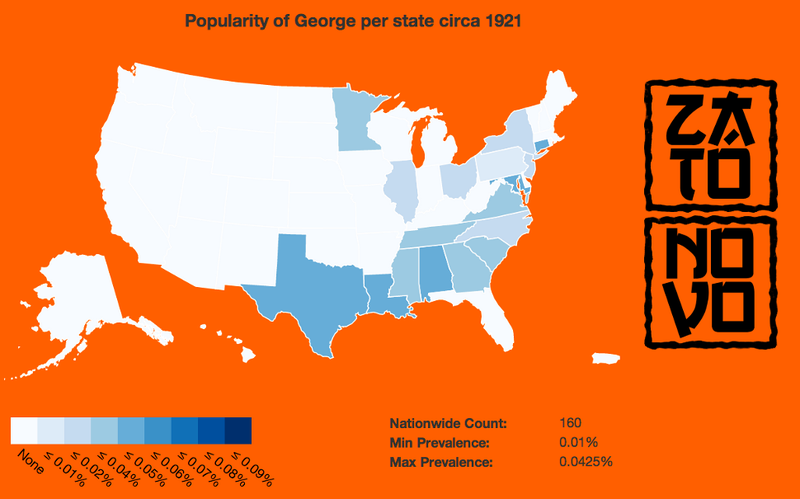 "[W]hat is most interesting is to see how some names are popular in a specific geographic region while others are more broadly popular," he writes in a blog post. "Presumably the way names spread are governed by demographics, technology, and media." Please share your own personal maps in comments!